Had a nice weekend? I did, which was nice. 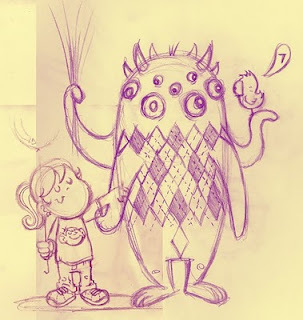 I had a chance to do some sketching of some of the latest illustrations I want to do. I found my path and I think it's going to be exciting. I really want the next batch of work to be fun and evoke emotion. What emotion, doesn't matter, as long as you feel something when looking at the illustration. 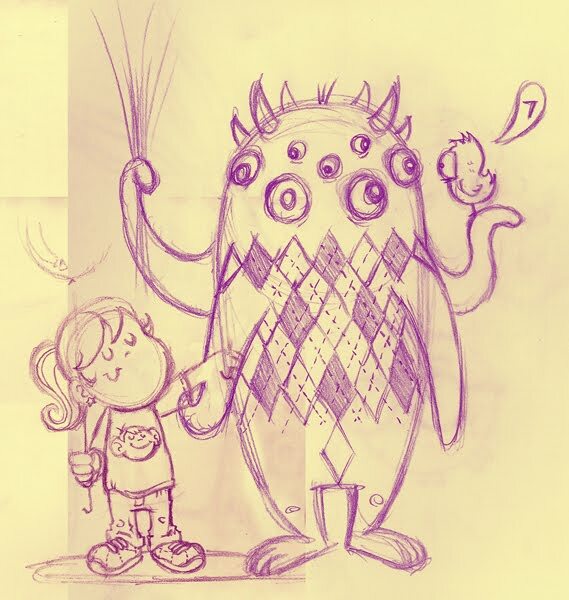 So here's a really rough sketch of two new characters I've been playing around with. I can already see where I'm going to make some changes, but I thought I'd show you this thumbnail so you can see the progress. So what do you think? Do more thumbnails. I love sketches. I want to sculpt the Mooo-nster, (and his Cyclo-bird) when you want to bring it up to the 3D dimention. I have real, meaning paid, work so I haven't been doing any of my own drawing recently. I have been dragging around a new sketch pad in the hopes that there will be a few minutes to spare but no such luck. I'm glad to see you're sketching though. Hey, who won the T-shirt?